With less than a year to go to the 2019 Rugby World Cup, Ireland will face the All Blacks in Dublin, where they’ll attempt to put down a marker. The first meeting of the sides in two years, it will pitch the top two nations in the world rankings against each other. 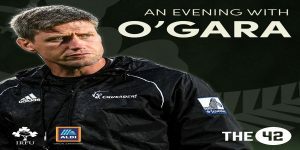 The42 will gear up for the mouth-watering November Internationals clash in the company of Ireland and Munster legend, Ronan O’Gara, with a very special preview event at the Liberty Hall Theatre on Dublin’s Eden Quay on Wednesday, 14 November @ 7pm. The Crusaders assistant coach will bring his unique insight to a conversation with Murray Kinsella and Gavan Casey of The42 as we’ll explore New Zealand’s winning mentality, what we can learn from their culture, Ronan’s memories of playing the game’s best team throughout the years and how he sees this clash playing out at the Aviva Stadium. Tickets are €20 and you’ll receive a complimentary copy of The42’s new book Behind The Lines II on entry. We would like to thank Aldi for their support with this event.